If you have been looking for a way to add an additional display to your computer, laptop or netbook, the HIS Multi-View+Sound Adapter looks to accomplish these goals. 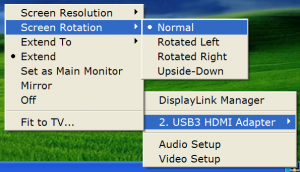 It works simultaneously with your existing video outputs and connects to your USB 3.0 or USB 2.0 port to send an audio/video signal from your computer to an additional display monitor through an HDMI cable. Lets take a more detailed look and see what the unit has to offer. This device is HDCP complaint, enabling display of commercial DVDs through the adapter. It has DirectX 10 & 11 game support of up to 60 FPS. 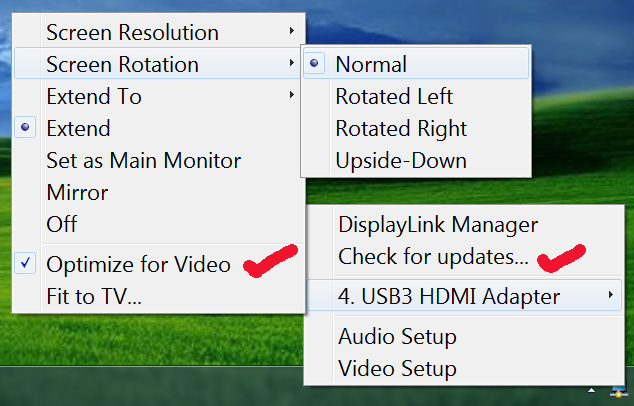 Full HD 1080p video is supported. Moreover, resolutions of up to 2048×1152 are supported. 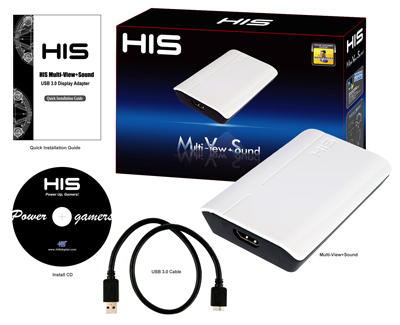 High Definition Audio such as TrueHD and dts-HD, however, are not supported on the HIS Mutli-View+Sound Adapter. You can play Blu-ray material in its full video resolution, but standard, non-HD definition sound will be heard. Unlike most ATI video cards, most nVidia video cards do not allow all their video card outputs to work at the same time. Their limit is two video outputs working simultaneously. HIS Multi-View+Sound Adapter can therefore be very helpful if you need more than two displays. 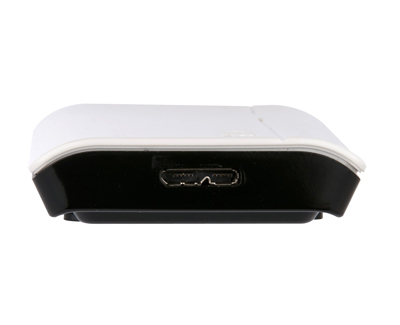 The retail box contains Multi-View+Sound Adapter, Installation CD, Quick Installation Guide and a cable that has USB 3.0/2.0 standard connector on one end and this connector on the other. Note that the box does not come with an HDMI cable, you will have to use your own. Make sure you make a backup of the 15MB driver file from the installation CD because, as of this writing, it is not available on HIS web site for download. Install the drivers before connecting the adapter to your PC. “Crossfire” and “SLI not in SLI mode” are listed as unsupported GPU configurations. However, this product was tested to work on a system running two HIS 6870 HD graphics cards in CrossFireX mode. The device supports all graphics cards under Windows XP. Under Windows 7, and all graphics cards other than SiS graphics cards are supported. Depending on the material being transmitted, if you do not have a USB 3.0 port, you may only see performance differences at very high resolutions, so having USB 3.0 is certainly not a mandatory requirement. It should be noted however, that excellent performance results may not be the same on older/slower hardware. Your receiver will play sound when connected to the HIS Multi-View+Sound Adapter but High Definition Audio formats are not supported. I tried playing Blu-ray material and the sound came through just like it did when playing Standard DVDs, however, it wasn’t being detected as High Definition Sound. This means you will have to continue to use your video card to get high definition sound formats such as TrueHD and dts-HD. Audio/Video tests were successful using various freeware software DVD players and retail software DVD players such as ArcSoft TotalMedia Theatre and Corel WinDVD. HIS Multi-View+Sound Adapter worked on all of them, except for Cyberlink PowerDVD, indicating a problem with Cyberlink software on my system, not a problem with the device. In case of problems, disconnect the adapter, uninstall/reinstall DisplayLink drivers, then reboot the system and only then reconnect the device again. Make sure your DVD player’s Audio settings are set up correctly and also try using different DVD players. HIS Multi-View+Sound Adapter integrates seamlessly with your system, using very few resources. It is easy to use and is ready to go quickly under both Windows XP and Windows 7. It is an overall excellent USB to HDMI product. Street price for the HDMI version is between $60 and $80. The DVI version costs $10 to $20 less than the HDMI version. I got a question, how does this work, exactly? And, another thing, any Linux support? Hi, it works like this: "It connects to your USB port to send an audio/video signal from your computer to an additional display monitor through an HDMI cable." From Adapter using HDMI cable to display monitor. Windows is required to use this particular product and only Windows drivers were included. Yea, I get that, but I mean, under the hood. Does it has something to do with the GPU, or does it has some kind of GPU inside that renders the screen? Could you ask HIS for some info, maybe? The first one I saw was EVGA's... I think it was maybe DVI Plus? And it really intrigued me. You connect USB, you connect DVI, and bam, a screen! Can't guarantee an answer, but will try to find out for you. It may be a while.